For immediate disposal - Grafton ex-LNER steam crane no. DB331322 . This crane has been out of use at North Norfolk Railway since about 2005 but was cosmetically restored about 10 years ago. There is its partially restored boiler available with it. It includes a GW bogie bolster runner wagon. The NNR is reluctant to scrap it and is willing to donate to another heritage railway/museum on basis of re-use or as an exhibit. Not willing to donate for scrap. It is currently stored at Holt station. Any successful recipient would be expected to remove it from the North Norfolk Railway at their own cost within a few weeks. All enquires to Andrew Munden General Manager at North Norfolk Railway Sheringham NR26 8RA. SpudUk and The Saggin' Dragon like this. Looks interesting, any idea how much it can lift? It's not a Breakdown Crane so might conjecture it's capacity at around 10 Tons at most - but possibly much less. 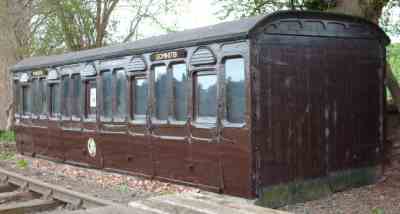 Rowden Mill Station is looking to find a new home for a grounded GWR 82 Four-wheel Second built 1895. Detailed information available on the carriage survey. We are unlikely to ever be in a position to refurbish this coach body and as it is a unique example we would prefer to see it go to someone with the time and skills to take it on. It is structurally sound, is dry inside and has had the roof properly redone in the last few years. The interior has been stripped out but the roof/ceiling panels remain. All doors are present. The original floor is missing, however it has been reinforced at ground level in order to keep the structure solid, and was moved to its present location on the Rowden Mill Station site by crane a couple of years ago. Regarding price, we are open to offers in terms of swap or partial swap for other items more manageable to us. If a cash transaction we would look to prices paid for other coach bodies of the same era which have sold recently on ebay as a guide. To be sold "as seen / where lying" on the Swanage Railway. Viewing is advised before purchase - PPE will be required. £1,150 plus VAT or near offer. Looks like the kind of thing ex Prime Minsters buy at an ex Prime Minster price. I think some people have ever so slightly unrealistic ideas of value! Firewood must be ruddy expensive in Norfolk. Bluenosejohn and ghost like this. What is the going price for grounded vans/coaches? Generally heritage railways normally look to secure a deal at £0 buyer collects! Steve, SpudUk, ghost and 4 others like this. A lot of the NNR's vintage bodies were either free or such a low cost that the transport to the railway far outweighed the purchase price. I was told a story where apparently one of the bodies cost the railway a garden shed from a local store, as the original owner's only concern at the railway taking his coach body was that he needed something else to put his tools inside! SpudUk, jmh59 and Bluenosejohn like this. I bet Cameron feels gutted. We have a similar experience at Havenstreet, I think that all of our grounded bodies have been free. Many of the previous owners have taken a great deal in interest when they have eventually made it into the workshops. I believe the same goes for many of the Victorian bodies on the Bluebell as well; essentially free, but with the railway paying for their removal. Of course, that might be a non-trivial amount as it is likely to involve crane hire and a lorry move, depending on the level of access available. Does anybody know of any Mark One coaches which might be available for sale ? Condition of running gear & bodywork not too important as coach would not be a runner.